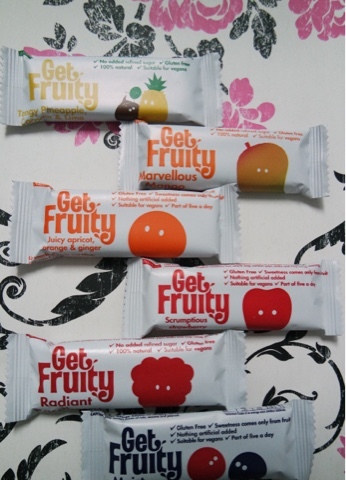 I decided to give the Get Fruity bars a go. There are so many different flavours available I just couldn’t decide what to try so went for a mixture! The best thing about these bars is the fact they are the perfect snack. You can pop one in your lunch box, hand bag, in the car, even in your pocket! They are gluten and dairy free which is a massive bonus as I have a slight intolerance to both of these! They are suitable for vegans too and have no added sugar, so they are pretty much something everyone can eat! The bars are all made by blending oats with fruit, so it is one of your fave a day(big thumbs up). I am really impressed with the large range of flavours, the first one I tried was the moist mixed berry. I usually don’t eat berries as I don’t like the texture of them and the seeds, so usually to try and up my fruit intake I blend everything into smoothies, so it was nice to actually be able to eat something good for you and it taste good. The raspberry and strawberry bars were so yummy too, I think the berry ones are my favourites. The pineapple, coconut and lime had a taste I cant really describe. I am so used to blending lots of fruit together for my smoothies that I like having multiple flavours in one, so this was really nice and refreshing almost.